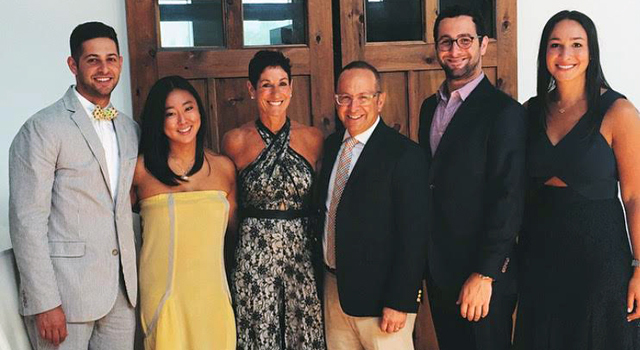 WEST HARTFORD – Jessica an Eric Zachs and family will be honored by Solomon Schechter Day School of Greater Hartford at the school’s annual Ner Tamid Fundraiser gala to be held on Sunday, April 29, 7 p.m., at Beth El Temple in West Hartford. The evening’s featured performer is Jewish-American Reggae artist Matisyahu, who agreed to perform at the event after receiving a video recording of Schechter students, their arms linked, singing his song “One Day.” Every Friday morning, the students at Schechter join together at RELISH, an assembly that celebrates community and welcomes the Sabbath. They conclude by singing “One Day,” which expresses hope for an end to violence and a prayer for peace. Matisyahu’s closing number at the gala will feature Schechter students singing “One Day” alongside the artist. For more information on the Schechter gala and Matisyahu’s performance, visit ssds-hartford.org. CAP: Jessica and Eric Zachs (center), with their children Ben and his wife Paige (left), Jacob and Zoe (right).